Rockwater designs and implements dewatering schemes - assessing hydraulic properties using visual inspections; injection/pressure testing; test drilling; bore construction; and test-pumping techniques. 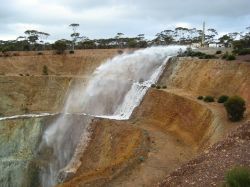 Mines that intersect significant aquifers require pumping from bores and/or sumps to limit the ingress of water to the workings. 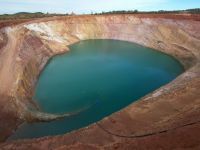 Open-pit mines commonly need dewatering ahead of mining to ensure wall stability and pit-floor workability. 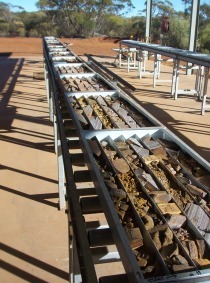 Rockwater has installed dewatering bores in a variety of geological environments, including; faulted and weathered crystalline bedrock, vuggy and fractured chert, dolomite and banded iron-formation, clastic and chemical sediments within sedimentary basins, vuggy and cavernous, and highly porous calcretised lamproite associated with diamond pipes. Rock conditions are often challenging, involving the use of diverse drilling techniques, such as air-rotary, air-hammer, mud-rotary and dual-rotary. Below are some mine dewatering projects conducted by Rockwater. Please click a link for more details.